High protein snack bar with real fruit pieces and mixed seeds. The Celebrity Slim Snack Bars are portion controlled and you can have up to two per day. They are an approved snack on the Celebrity Slim Programme Trim phase. These snack bars are designed to be used in conjunction with the Celebrity Slim Programme. Each Snack Bar constitutes one allowable snack on the programme. Fructo-Oligosaccharides, Sunower Seeds (30%), Soya Protein Crisps (12%) (Soya Protein Isolate, Tapioca Starch, Calcium Carbonate, Salt), Pumpkin Seeds (9%), Water, Sunower Oil, Whey Protein (4%) (Whey (Milk) Sunower Lecithin), Freeze Dried Raspberries (1%), Freeze Dried Blackcurrants (1%), Natural Flavouring (0.5%). Made in a factory that handles nuts, sesame seeds and cereals containing gluten. Servings Per Pack: 1 Serving Size: 40g. Energy 658kJ (159kcal), Fat 9.1g, of which saturates 1.2g Carbohydrates 4.5g, of which sugars 0.6g, Fibre 12.6g, Protein 8.3g, Salt 0.16g. Energy 1,644kJ (397kcal), Fat 22.9g, of which is saturates 3.1g, Carbohydrates 11.3g of which are sugars 1.5g, Fibre 31.4g, Protein 20.8g, Salt 0.40g. This product is a meal replacement for weight control. This product is useful for the intended use only as part of an energy restricted diet and other food is a necessary part of the diet. The product is a formulated meal replacement. It is not to be used as a total diet replacement and should be used in conjunction with an exercise program. If you have any medical conditions or are taking any medication, please contact your Healthcare professional before starting on the program. Not suitable for pregnant or breastfeeding women or children under 6 years of age. 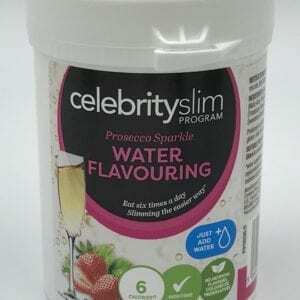 * Healthy and effective weight loss when substituting two daily meals with meal replacement products from the Celebrity Slim energy restricted diet and exercise programme. Results may vary by individual.